Well, that was the plan. But you know that old joke, ‘How do you make God laugh?’ Answer, ‘You tell him your plans.’ It had seemed so simple when I drafted the words in August 2016. Over the years, I’d shifted the emphasis of my annual retreats from theoretical to experiential astrology. Living the chart. I’d had no choice over the 2017 date, it was the only week Abbey House had left so the chart was not an electional one, it was seemingly random. Little did I realise at the time of booking that it was to be our last astrological retreat at this stunning venue. 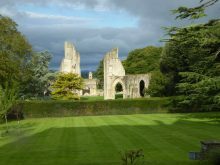 By the time we arrived, the Abbey trustees had refused to renew the lease, so the centre we’d enjoyed for fifteen years was to close by Christmas. Do the Abbey trustees see the irony of that I wonder? It has been such a refuge for lonely parishioners to join in holiday festivities. Now, there’s no room at the Inn. The staff are understandably deeply upset, most having served the house faithfully for years. Those of us who’d participated in previous workshops were bittersweet and sad. The house itself was angry and unsettled. It had been the Bishop of Bath and Wells’ retreat centre since 1954. Ghosts were stirring, literally. Uranus, the catalytic planet of chaos and transformation and the new order was at the root of the chart for the start of our retreat; trining Saturn, the old order, on the Ascendant; and the North Node, the soul’s purpose situated in the house of birth, death and rebirth. Magic and changes were afoot. And I had twenty eight people booked on the course. A full house. The view from the sitting room, Abbey House. Note that tiny white dot above the tower. Its relevance becomes apparent later. 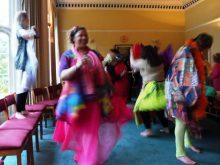 As Terrie Celest and I sorted an enormous pile of costumes spread over my sitting room floor, we reminisced about past workshops and how brilliantly some participants had taken on their roles. We pondered who would take on which planets and zodiac signs this year. Laughing as we thought of the most likely, and unlikely, candidates. People ‘self-select’ – I leave it to ‘chance’, asking people to draw lots. We discussed my intention to work on the Karpman drama triangle (more of that later). As there were more participants than there were planets, signs and other roles, I asked Terrie if she’d take the role of Niku. This eccentric celestial body had demanded my attention via an accidental, serendipitous viewing of The Sky at Night and a recording of a Horizon programme. It moves backwards and perpendicular in relation to the rest of the zodiac. Just what was needed, or so I thought, to stir participants from their complacency and elicit change. Retrograde Saturn, the Lord of Karma, sat in Sagittarius in the first house, clamping down Sag’s adventurous nature – or offering an opportunity to regain karmic wisdom depending on your perspective and intention. Given its size, Terrie and I had decided to put up some ‘guidelines’ for the group. The first being, ‘take responsibility for yourself and how you feel. See us if anything comes up.’ Another being ‘stay out of the story.’ (Neptune was opposite Mercury, so many opportunities for illusion and self-deception could open up, not to mention that Karpman triangle). 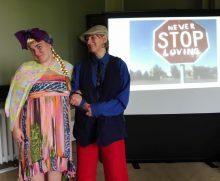 And, importantly for a facilitator who is electro-sensitive and already under pressure from the Glastonbury free wi-fi invasion, ‘leave your mobile phones in your room.’ That led to, unvoiced to us, grumbles about there being ‘too many rules’. Sag really isn’t keen on such things, even with Saturn moving backward through the sign. This was an experiential workshop. That Ascendant was most beautifully embodied by a participant who arrived from South America extremely late. She’d phoned to say her plane was stuck in the air, but then apparently teleported herself from the distant airport within an hour or so. She was late to each of the three sessions she attended too – Saturn is the Lord of Time and Delays as well as Discipline and Boundaries. She took the wisdom she wanted – learning how to read the Akashic Record – and then rode off for several days protracted retail therapy without having the courtesy to inform me. Well, Sag’s ruler Jupiter was in Libra, making a sextile aspect to Saturn, and Saturn was part of a grand trine with Uranus and the North Node. So, expect the unexpected – in spadefuls. I usually describe a sextile as the shortest route to hell. It’s all so easy, until it drops you straight into something deeply karmic. She clearly wanted to avoid any form of confrontation, which is so Libran. We found her costume stuffed into a corner. She said ‘goodbye’ sweetly when I bumped into her on the penultimate day as she hauled her purchases out of the door and into a waiting taxi. But no explanation was forthcoming and I didn’t ask. Remember, ‘Don’t get stuck in the story’. She was simply playing her part. No Ascendant, along with other factors, made me rapidly rethink my plan to enact the inception chart in a session where each of the signs and planets, in other words the whole group, spoke how they felt from their place in the chart. (Which was fortunate, given that I later discovered that the chart that Astrocalc had produced was for a different time, Mercury-Neptune at work). The gods had indeed been laughing. We usually talk the chart through early on so participants know what to expect. But this time I wanted to be different. Sag rebelling against the same-old-same-old. The theory behind my intention of offering participants an opportunity to experience an energy they didn’t normally embody worked well – in most cases. But not in the way I’d expected. Unpredictable Uranus was at the root of the chart in me-orientated Aries and several people went their own way regardless, or grudgingly accepted roles they would never have chosen. The most timid people in the group found themselves cast as the out-going Leo Sun and Mars, and as Venus. In the chart, Venus was hiding at zero degrees of Cancer and sitting exactly in the middle of the seventh house of relationship. Cancer does like a shell to hide under. Our Venus said her head was too small to wear her delicate headdress, so she hung it round her neck. Her beauty was not on display. In the chart, Venus had a difficult aspect to Chiron, the wounded healer planet. Due to health issues, Venus was clearly uncomfortable in her glamorous costume, and wore less of it each time. 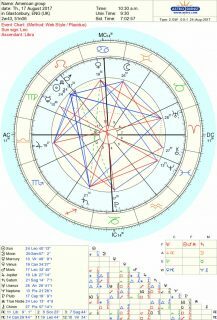 In the chart, Mars was conjunct the Sun in Leo and our lovely Mars (who had been with the group from the earliest days) was one of the smallest people in the room but gamely tried to keep her hard hat on, until another planet cheekily stole it from her on the last night (Mars being semi-sextile to Mercury). The midheaven of the chart was in peace-loving Libra. Maybe that’s why it took awhile for people to make their grievances known. Especially as the Moon (the past) was in the depths of Scorpio. Although our Moon did her best to shine brightly and cast light into the shadows. My thanks to those who had the courage to finally confront me, or their karmic challenges, and to recognise and integrate the release that occurred when they finally did. Much of that healing occurred in the small groups that formed to work on charts. Another manifestation of the chart energy. The content is confidential, so cannot be shared here. 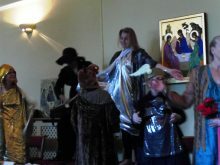 But it was interesting to note that the guy who had the previous year taken on the Jupiter role was this year the M.C. Where the chart heads for. Only he called it, ‘The Master of Ceremonies’. He had little opportunity to direct things towards Libran peace and harmonious understanding, except behind the scenes. Niku, right, in an uncharacteristically quiet moment as majestic Libra passes by. Sadly I didn’t get a picture of Niku flashing the light-saver. In the background, Mars loses her hard hat to Mercury. So, we come to ubiquitous Karpman triangle or ‘The Drama Triangle’ as Sue Lilly calls it. 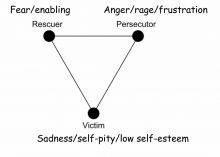 It consists of Rescuer, Persecutor, Victim roles. It can be played out within a group, or within one person. Someone sets out to rescue someone else and, surprise, surprise, quickly becomes the victim or the martyr, ‘after all I’ve done for you.’ Or, starts out as the ‘victim’ but quickly becomes the persecutor who makes life a misery for all around them. It’s addictive, seductive, and so hard to break out of. I prefer to call it starring in your own soap opera. It plays itself out in so many ways in this and other lives, pulling those roles across the centuries. In this practical, experiential workshop I intended to identify how these dramas had shown themselves and how the fear, anger and sadness that accompany them could be turned around to find the gift at their heart. And, as I put it, ‘empower your future life.’ I don’t like that jargonish word ‘empower’ but haven’t found a better one yet. It felt so appropriate for this group – and this chart. I usually refer to the rescuer-persecutor-victim scenario as ‘the karmic sub-plots of Pisces’. In the Karpman Triangle in personal or across birthchart synastric connections, there is often an emphasis on Pisces and Neptune, or 12th (karmic) or 8th house (ancestral) placements, also Libra and Cancer (especially as shadow aspects. That is, reflected in the more challenging and ‘negative’ qualities of the sign opposite the Sun or Moon.) All signs are prone to play out variations of this drama triangle though, and Mars and Pluto play their part in the soap opera too, of course, in addition to Venus. 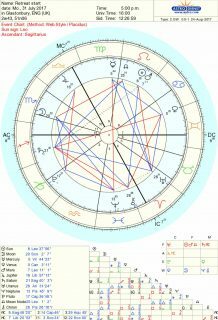 So, here we were with a chart that had Neptune and Chiron in Pisces, with Neptune opposite Mercury and trining the Moon. You don’t need to be an astrologer to feel that one. It positively reeks of ‘oh poor me, how hard done by I’ve been, let me tell you my sob story.’ It’s the plot of a soap opera all by itself. With Pluto in authoritarian Capricorn in the second house, there’s an element of the persecutor too – and of projection, ‘it’s you, not me.’ That people-pleaser Libra midheaven so wants to step in and rescue everyone and make it all ‘nice’. It would have been easy for me to step into any or all of those roles during the week, especially when someone let rip their ire at me late at night. But I recognised it for what it was. An old, festering boil that had scarred over and needed lancing. I had ripped the scar off. Now I needed to do her the courtesy of listening. That was all that was required. Not excuses or evasions or sympathy-plasters. Simply listening while it all poured out. Accepting my part, but not becoming victim or trying to rescue. It wasn’t my soap opera. Nor, by the time she’d finished was it hers any longer. We used Chrome Diopside, Thulite and Sugilite to place on the charts or participants to assist the healing and releasing of the dramas – and a huge piece of Green Zoisite in Thulite that I had serendipitously discovered in my storage unit when I went to fetch the costumes. Along with a Shiva Lingam, it was one of the anchor stones for the Venus and Mars integration session, but did double duty as a Karpman cleanser. Mentally stand at each point of the triangle and see how you feel about it (it can help if you move around the room). Which one is most comfortable? Which one least? Then stand in the middle, and then see how it feels to step out entirely. I’d intended to use an email to the workshop administrator as an example to the group of the triangle in action, demonstrating how it’s possible to slide from one role to another almost in the same breath. In the course of a dozen lines, it had moved from ‘poor me’ (victim), through to ‘it’s all your fault’ (persecutor), and included the excuse of being too busy helping someone else (rescuer). Ending with ‘thank you for your understanding’ (back to the martyr). But, although I would have been using it anonymously, it felt as though it could have made the writer feel like a scapegoat, a victim. A role she revelled in and could well have revealed herself to the group to engage their sympathy. ‘Here I am being persecuted again.’ Having Pluto on the Ascendant myself, I most certainly didn’t want to step into the role of persecutor. I needed to stay out of the drama. Fortunately someone else in the group had the courage to work through her own soap opera. Perceptive and psychic, she had identified many lifetimes of trying to save someone from himself and make good a promise to facilitate his spiritual development (i.e. the rescuer). In doing so, she had inadvertently played victim/martyr and persecutor many times over in addition to rescuer. She was playing out that role out again and was about to maroon herself on a remote island in order to do so. She jumped at the opportunity to have the group witness her shift out of it, clearing away the old soul promises that bound them together. When one member of a group makes a shift like that, the whole group benefits. So, we facilitated a tie cutting and a reframing of that ancient vow that had kept two souls bound together over many lifetimes. 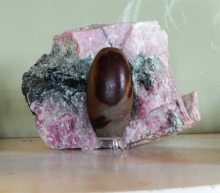 One of our group is a gifted crystal and energy healer, who needed to step into her power. She assisted with appropriate crystals while the rest of the group held a space in which the transformation could take place. A markedly different woman left the workshop on the final day to the browbeaten one who had arrived. The integration of Venus and Mars. 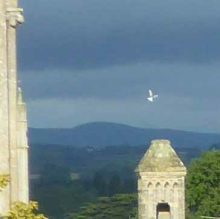 When I returned to Abbey House the following week to lead a thoroughly enjoyable mini workshop with a group of American women on a sacred pilgrimage, I took a final nostalgic photograph out of the sitting room window. The chart was very different by then. Expansive Jupiter in harmonious Libra was in the first house. Pluto at the I.C. root, ready to dig deep. They arrived exactly on time, only one unavoidably tarrying by a few minutes. The Moon was in Gemini and, although Mercury in Virgo was still opposite Neptune, Mercury had turned retrograde and the energy was tightly focused inward. So many pertinent questions were asked and answered and incredible journeys made. All within two hours. Time expanded for us. That felt as though our inception chart had come to fruition, given birth to a brighter future for all. Just in time for the solar eclipse, which happens to fall opposite my natal Niku position. How apposite. If you need to know how to reframe and rescind vows and promises from the past, and why such things are still relevant in the present, read my books The Soulmate Myth and The Book of Why. Both available from Flying Horse Books, an imprint of The Wessex Astrologer.